You've tried will-power and it just hasn't worked. You've bought those unpleasant tasting concoctions and painted your fingers with them in an attempt to end your compulsive nail biting. Maybe you've even taken to wearing gloves when you can get away with it. But, sooner or later, your hands just seem to automatically return to your mouth and you're nibbling and gnawing and biting your nails once again. Only now there is so much less to chew on and you're beginning to feel really helpless. Perhaps you bite below the cuticle and begin to bleed. How you wish you could end this habit! But you just haven't found a way of doing it...until now, that is. When we persistently bite our nails, or the cuticle around the nails, then we are experiencing some form of inner anxiety – we are engaging in a behavior that we learned at a younger age that was designed to take some of the heat off the way we were feeling at the time. And nail biting so easily became a habit. The good news is that even the most persistent habit can be broken. And there really is no better way to do this than through the skilled use of hypnotic programming – or deprogramming, to be more exact. Our End Nail Biting Now hypnosis program is state-of-the-art hypnosis therapy designed to release you from nail biting once and for all. This cutting-edge hypnosis recording will help guide you deep within your own subconscious mind, where real change can take place. As you relax, you are gently shown how to release the tensions and anxieties that continue to fuel your nail biting and replace them with feelings of calmness and ease. If you have had enough of endlessly biting your nails, if you want beautiful, healthy nails and hands, then this End Nail Biting Now program is exactly what you need to move forward with your life. 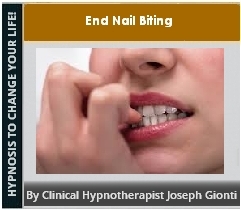 Download the End Nail Biting hypnosis program and leave your nail biting behind for good!